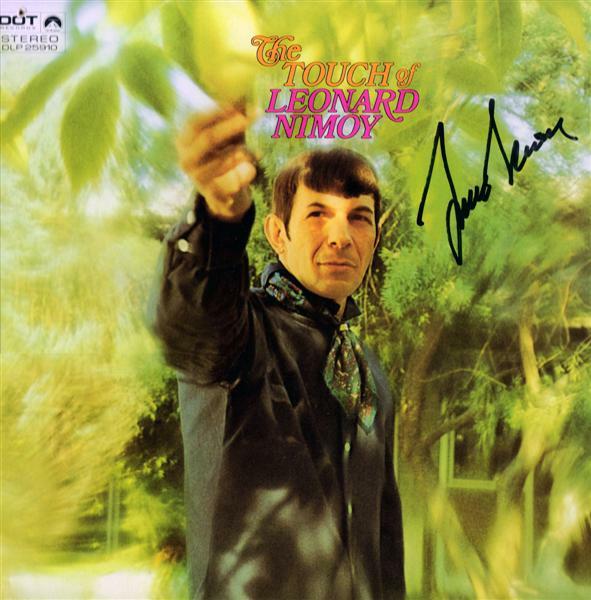 A few months ago I wrote of my admiration for Leonard Nimoy’s album, The Way I Feel. Some of you kind readers posted your recommendations that I make sure and get the record he released after that in 1969, The Touch of Leonard Nimoy. Well, I made sure and got all five of the records that he recorded on the Dot label, but you kids sure knew what you were talking about with this one – it’s gorgeous. For many years, my Sunday-morning, pancake-flippin’ music was relegated to Elvis Presley, but since I bought The Touch, well…Elvis has been collecting dust. Not that Nimoy can croon like Elvis or anything, but there is something comforting in his voice as he sings of love, peace and the fellowship of man. The arrangements put together by conductor George Tipton are exceptionally lush and tend to bring out the tenderness in his vocals. Ahh, what am I doing? If this were a livejournal, I suppose I’d sprinkle some hearts and flowers around this paragraph. My obsession did not stop at merely picking up his records, however. Now, some guys might take their lady friends for a romantic weekend to the mountains, or the beach or one of those bed and breakfast thingies. Not this guy. Last month, I took my old lady on a whirlwind trip to sunny Sacramento for a Star Trek convention, where Nimoy was appearing, to get my records signed. He was kind enough to sign them and pose for a photo with me, for a princely sum of 120 bucks. Hey, the guy implanted the “Live Long and Prosper” motto into our culture, and he’s living up to it – good for him. And good for you, I was going to only post the two songs that Nimoy wrote himself, “Maiden Wine” and “A Piece of Hope.” But the whole record is just so damn good, so have at it. This entry was posted on Friday, October 20, 2006 at 5:33 AM. You can skip to the end and leave a response. This stuff is so damn bad it's funny. It's strange how Spock and Cap'n Kirk became golden throats that got away with sing-speaking through orchestrated schmaltz. Can you post Bing Crosby's verson of Hey, Jude? plus he sang "good morning starshine" on the x-files episode of the simpsons. My favorite Nimoy album, and such a great cover image. Thanks! His version of Nature Boy shall always remain my favorite. Oh, and did you notice that both Nimoy and Elvis do I Just Can't Help Believin'? Those two versions together in your Sunday morning kitchen will lead to the most delcious pancakes in the world. 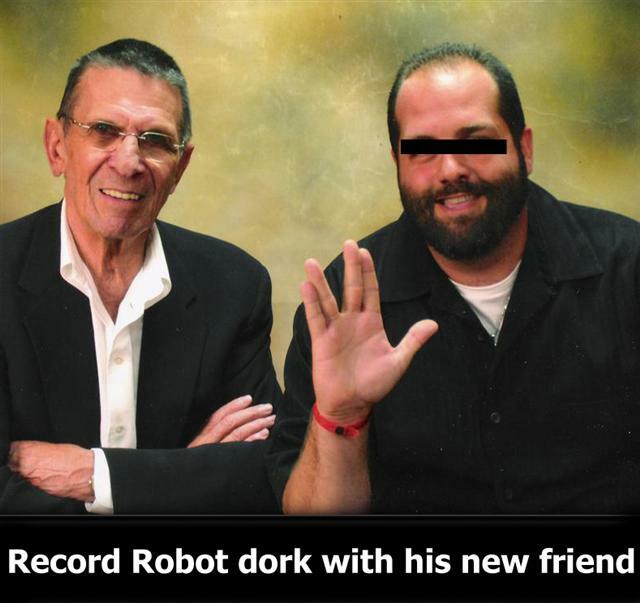 Do you have these songs from "The New World Of Leonard Nimoy"? These are the only ones I don't have! That photo must be from the Sacramento convention. That yellow-green background is horrendous! (And here I was complaining about the dark background for the Chicago convention.) Customers should get better service for what they pay for! I can understand it if you choose to post music for a limited time, what I do NOT get is why you persist in keeping the dead posts around indefinitely, don't you realize this pollutes search results with years old dead link trash that serves no informational purpose which has to be sorted through in search for current relevant material. © The Record Robot 2005 - Powered for Blogger by Blogger Templates - Original design by Michael Heilemann.